Fulham have won four games since Felix Magath took charge in February. 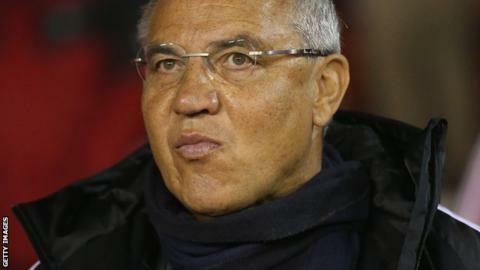 Fulham manager Felix Magath labelled his side's season "a catastrophe" after they threw away a lead to lose 5-3 at Championship leaders Nottingham Forest. Fulham are bottom of the table with one point from seven league games and are already four points from safety. Magath told BBC Radio 5 live: "It is a catastrophe. I have never had that before in my career and I am very sorry for our fans. "I ask for patience from the fans. I have no doubt we can get up the table." Forest took an early two-goal lead at the City Ground through striker Britt Assombalonga but Fulham came back to lead thanks to two goals from £11m signing Ross McCormack and a volley from Hugo Rodallega. But Forest responded and secured victory with late goals from winger Michail Antonio, Assombalonga - completing his hat-trick - and Jamie Paterson to leave Fulham without a league win since 12 April. "We were very unlucky, we played a good game but things were not good enough for us," Magath said. "We should have had a fourth goal when we were 3-2 up and the game would be done but we didn't and we made one mistake and they equalise and it revived them. "I am very sad and think all the time about our performance and playing style." Fulham were relegated from the Premier League in May - a situation Magath blamed on ex-owner Mohamed Al Fayed - and have won just four games since the German took charge in February. But the 61-year-old - winner of the Bundesliga three times as a manager - says he is in regular contact with owner Shahid Khan and is not worried about his future. He said: "It's not good enough for Fulham. But we have a special situation because we have to build a new team, there were a lot of older players and a lot of players who don't want to go with us in the Championship. "Rebuilding is always difficult, but I don't think about my position. I just work with my team. "I talk to the owner every week, I speak to him and agree with him. But he is in charge. Who is paying, who is the man who makes the decisions? It is clear."